Stuffed cannelloni with a creamy pesto and cheese mixture is a great and satisfying meal for a vegetarian. You can also use jumbo pasta shells for this recipe. 1. Preheat the oven to 350°F. Lightly coat a 9- x 13-inch ovenproof casserole dish with vegetable oil. 2. Bring a large pot of water to a boil. Add the cannelloni shells. Cook according to package directions, for about 8 minutes or until just tender. Drain and rinse with cold water. 3. Combine the ricotta, Parmesan, pesto and egg in the bowl of a food processor and process until well combined. 4. Fill each cannelloni shell with about 3 Tbsp of cheese filling. 5. Pour about half tomato sauce into casserole dish. 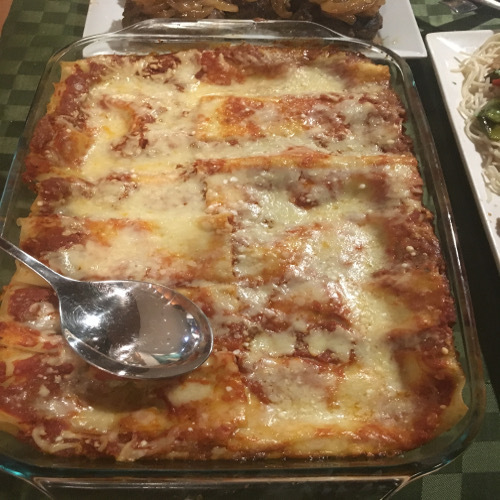 Place stuffed cannelloni overtop. Pour the remaining sauce over¬top the cannelloni and top with mozzarella and parmesan cheeses. Bake uncovered for 20 minutes or until completely heated through and the cheese is melted and bubbling. Garnish with fresh basil or parsley and serve.